70s muscle cars may never die. There’s a certain badass vibe to these things that takes them beyond the realm of mere four-wheeled conveyances. Splash a loud colour on them to match the volume of their motors and you have an icon from a golden age of American iron, oblivious of nuisances like fuel economy concerns and safe driving. If you’re thoughts take you to Bo or Luke Duke driving the General Lee, you wouldn’t be far off. “The Dukes of Hazzard” 70s TV show engrained memories of a similarly-coloured Dodge Charger into the memories of all the show’s fans. The Challenger is a big car, bigger than some crossover SUVs I’ve driven. This unapologetically large throwback to the glory days of Detroit muscle filled every parking spot I left it in, lengthwise at least. Optional black twin centre stripes run down the centre of my Go Mango-coloured tester, stem to stern, over the functional engine-mounted “Shaker” hood scoop and the longitudinal hood bulge. Pick this colour, by the way, and you’ll never want for attention. Also, you’ll always be able to find your car in a parking lot, no matter how large. The chrome fuel filler door sits high up on the left rear haunch of the car, standing out from the rest of this street rod’s body. A grill recessed under the hood and over the bumper partially conceals four high intensity discharge headlights. Bright dual rear exhaust tips poke out from the other end of the car, while a spoiler protrudes from the trunk deck. The side mirror housings wouldn’t look entirely out of place on a car several decades older, body coloured or not. More obvious modern touches do creep in. Oversized Brembo disc brakes peaking out from behind SRT Hyper Black lightweight forged aluminum wheels distinguish this century’s version of the Challenger from its ancestor. 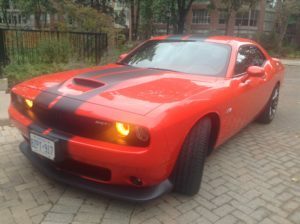 Still, kudos to Dodge designers for instilling a heritage vibe the Challenger wears like a glove. Keyless entry will force fanatics to accept that this isn’t your parents’ Challenger. Just about everything inside my Challenger was suitably black, except for the optional red seat belts. Stitched leather covers the flat-bottom steering wheel and the knob on the 6-speed manual shifter. The manual transmission, by the way, is an option on this car. How times have changed. This shifter is rakish, to say the least. In first and all odd-numbered gears, as well as reverse, the lever leans far forward towards the climate control cluster. In second, and all even-numbered gears, the level stands straight up. There is no lean back. Leather seats, complete with side bolsters, look solid. Given the length of the car – did I say it covers the length of most modern parking spots? – I’m surprised at how little room the back seats offer. Air vents emerge from the back of the centre storage console to enhance the comfort of rear-seat passengers of below-average stature. Those vents won’t make any difference in comfort to anybody taller. Leather isn’t the only material here. A carbon-fibre-look material and plastic cover the dash and doors. That plastic-look material communicates a certain disregard for luxury, a “who-needs-it” attitude that matches the car’s overall attitude. Carbon fibre serves as a setting for audio and climate control buttons and knobs just ahead of the shift lever. These controls aren’t mounted in a strictly aligned pattern. There’s an organic feel to their layout that’s just unusual enough to catch the eye. The whole dash is slightly skewed to the driver’s side. So is the central storage console, where Dodge stored the power and SD card slots. My girlfriend was riding shotgun when she had to charge her phone. That storage console lid opens away from the driver and not towards the back seat, so she had to reach over the lid to plug in her USB cable. That wasn’t the most ergonomic choice designers could have made. Other upscale touches do creep into the car. 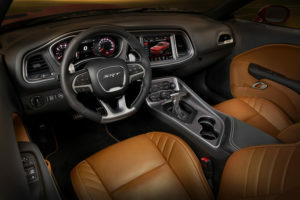 Lumbar supports on the power-adjustable seat will keep the backs of aging muscle car fanatics from hurting too much as they wrangle the heated steering wheel, clutch and shifter. Drivers will quickly get the right setup from the power tilt and telescoping steering column too. 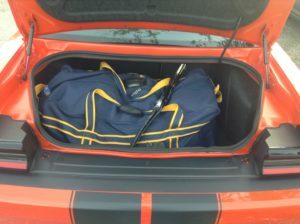 The Challenger’s trunk could probably have fit two bags with sticks going through the 60-40 split-folding rear seat. The 8.4” Uconnect touchscreen leads to all the modern conveniences. Audio comes from 18 Harmon/Kardon speakers after passing through an amplifier. This includes two subwoofers in the trunk, right beside the battery. Based on my (ahem) experiments, the audio system packs about as much horsepower as the engine… more on that later. After having tested a vehicle with no physical controls for music or climate controls, I’m grateful to Dodge for including knobs for tuning and volume. These will always be more intuitive and easier to use than touchscreen controls. Designers might want to consider similar non-touchscreen controls for the heated and ventilated seats. These make a lot more sense than sticking gauges on top of or in the dash. 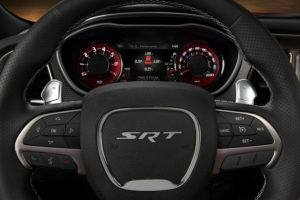 They also prove easier to work with than the single digital information control (DID) in the instrument cluster screen. That screen lets you scroll from one gauge to the next using steering-wheel-mounted buttons (It gets taken over by the navigation system when you’re en route) whereas Performance Pages shows a number of gauges at the same time. 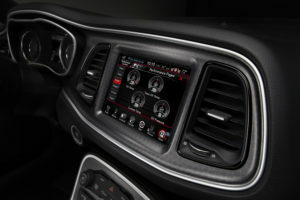 Fun fact: The navigation system lets you pick the Dodge model it uses as an icon on the screen. When I first got into the Challenger, that icon was a Dodge Dart. I quickly fixed that. The instrument cluster isn’t entirely modern. The gauge cluster features an analog speedometer and tachometer that straddle the TFT customizable instrument cluster and provide a heritage-inspired “tic-toc-tach” look with throwback radial numbering and concave shape. image courtesy Dodge. US model shown. This car isn’t just all badass looks. Under the hood lurks a 6.4L SRT HEMI V8 engine ready to drive the rear wheels with 485 horsepower and 475 lb.-ft. of torque through a TorqueFlite eight-speed or six-speed manual transmission. The aforementioned Brembo disc brakes provided adequate stopping power. This car positively rumbles to life, providing the sound quality muscle car enthusiasts want when they think about misbehaving. It continues to rumble and roar under many circumstances, including just about any degree of acceleration. On my first day with the SRT, I executed a quick merge into traffic from a right turn. I kicked out the rear end a foot or so. This isn’t difficult to do on any pavement surface, dry or wet. The overall driving experience makes me think of holding the reins on unbroken thoroughbreds. At parking lot speeds (low engine revs), the car lurches forward when I wanted to mosey along in first gear. Only at highway speeds is the Challenger contentedly quiet. I get what Dodge wants to do, and it’s a great experience, but I feel compelled to issue this warning: for people accustomed to more sedate daily drivers, the Challenger’s bad behaviour can get annoying. If you’re still up for the challenge, check out the centre stack for the Launch Mode button. This ought to help you preserve the rubber on your tires when you want to accelerate in a straight line while preventing wheel slip. Dodge thoughtfully includes a supplement in the package of manuals in the car to explain drive modes. Dodge wasn’t about to release this beast untamed into the wild. The usual active safety technology suspects are there, from a rearview backup camera to blind-spot warnings, always visible in the mirrors and audible when you activate the lane change blinker. ParkSense sounds alerts when you’re reversing into objects you can’t see out the rear window. Rear cross-path detection ought to keep drivers out of trouble in parking lots. Since the Challenger can throw down some serious power, traction control and stability control are logical additions to this beast. Here’s where the Challenger’s power will cost you. It’s rated at 13.9L/100 km combined (16.8 city, 10.4 highway). 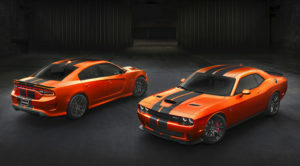 On top of its voracious thirst, the Challenger is by no means a cheap date – only 91 octane will do for its 6.4L engine. These numbers make me wonder why Dodge bothered to include a fuel consumption gauge in the Challenger. Sure, I got it dow to as low as 4 or so when on the highway and letting off the gas on a downhill slope. However, anybody who actually wants to watch this fuel economy gauge will probably be the type of person who finds this activity to be an exercise in managing guilt. This Challenger ST 392 retails for a base MSRP of $57,495. As tested, it comes out to $62,360. The looks. The stance. Fuel consumption. The ride. The overall package isn’t for everybody. But there is a niche of drivers who won’t care. Those drivers demand nothing less than the most authentic 70’s muscle car experience, with all its thrills and shortcomings. Those drivers will find the Challenger a compelling ride.